The historian Marc Bloch, who died a martyr’s death when shot by the Nazis, observed that “once an emotional chord has been struck, the limit between past and present is no longer regulated by a mathematically measurable chronology”. Although we are approaching the millennium of the First Crusade launched by Pope Urban II in 1095, the spirit of this archetypal conflict between a militant Catholicism and its rival faiths in Iberia, Southern France, the Eastern Mediterranean and the Baltic lives on. After the terrorist attacks on 9/11, George W Bush said: “This crusade… this war on terror is going to take a while.” As Jonathan Phillips remarks, his incendiary comment was a propaganda gift to Osama bin Laden, who for years had been talking about Jewish-Crusader attacks on Islam. Both of these books take us back to the period in western history when belief in the afterlife was paramount. Philips describes a society “saturated with religious belief”, where fear of damnation was universal. Ordinary life was fraught with eternal hazards. Practically every church contained frescoes or sculptures depicting the horrors of hell – devils gouging out the eyes of screaming sinners, living humans skinned and eternally roasted – contrasted with the peace, tranquillity, and safety of heaven for the saved. The Church’s message was terrifyingly simple: there was no avoiding the consequences of sin. Urban II, an ambitious and ruthless Frenchman, launched the movement with a brilliant new formula: wipe the slate clean by going on the crusade. All the vicious and violent misdeeds that were occupational hazards for medieval warriors and their entourages would be cancelled. For the knightly classes the “neatest aspect of all is that they could continue fighting – only now their energies would be directed towards the enemies of God, rather than their fellow Christians”. And who were these enemies of God? The obvious ones were the Saljuq Turks, who were moving into Byzantine lands. The ostensible excuse for Urban’s appeal to arms was a request by the Emperor Alexius in Constantinople, whose territories in Anatolia (now eastern Turkey) were being taken over by these semi-nomadic invaders. These encroachments, however, had been going on for many decades without much bothering the papacy, while the holy city of Jerusalem, the scene of Christ’s passion and site of his crucifixion and tomb, had been under Muslim rule for four centuries without scandal, with Christian pilgrims generally free to travel there. The first crusade, as Asbridge explained in an earlier account he published in 2004, was really about the consolidation and extension of papal power in the anarchic and faction-ridden lands of western Europe. Crusading redirected the energies of feuding warlords, “channelling their bloodlust beyond the borders of the Latin West for the ‘good’ of all Christendom”. Philips underlines this point by giving much fuller treatment than Asbridge to the papally-sanctioned crusades outside the Middle East – against the Muslim states in Iberia, against pagans in the Baltic and Cathar heretics in southern France. The outcome was a configuration of politics, religion and culture that we now take for granted: failure in Outremer (today’s Middle East), where the Latin kingdoms were doomed to extinction, being reliant on continued provisioning from western Europe; but success in Iberia, where the crusading ideology revitalised the Spanish Reconquista. As Asbridge explains in a masterful conclusion, the huge distances involved in mounting military expeditions or even maintaining regular contact with Levantine kingdoms situated thousands of miles away proved insuperable once the Muslim East had rallied to the cause of defeating the Frankish intruders. The other major contest between Latins and Muslims ended in Christian victory because of Iberia’s proximity to the rest of Europe. But ideology was also crucial, as Phillips makes clear: Castilian and Catalan rulers had fought Spanish Muslims for decades with the limited objectives of advancing their territorial holdings and securing commercial privileges; but after Pope Eugenius III launched the Second Crusade in 1145, the Iberian campaign became overtly religious, with Christian rulers securing the full array of papal indulgences and other spiritual rewards. Religious fervour added heroism to the conflict, but also cruelty. 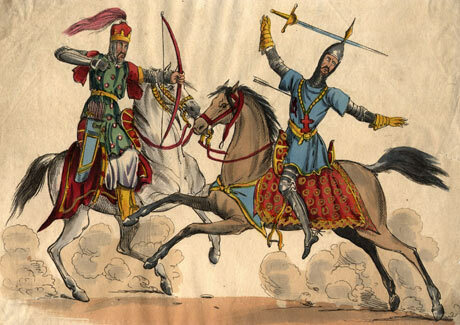 Both writers enliven their narratives with blood-curdling details culled from Muslim and Frankish sources: the decapitated heads of prisoners paraded on spikes to humiliate and enrage the enemy; battlefields where dead horses resembled hedgehogs from the quantity of arrows sticking into them; winter sieges where the people “tormented by the madness of starvation, cut pieces of flesh from the buttocks of dead Saracens, which they cooked and ate insufficiently roasted”. The papacy’s real agenda was revealed in the Fourth Crusade, when the crusaders sacked Constantinople in a campaign to install a short-lived puppet regime intended to extend papal rule over the eastern branches of Christendom. In the words of a Byzantine witness, the Franks thought nothing of violating nuns, “tearing children from mothers and mothers from children, treating the virgin with wanton shame in holy chapels, viewing with fear neither the wrath of God nor the vengeance of men”. Another Greek writer contrasted the brutality of the westerners with the humane treatment the Muslim hero Saladin accorded to the people of Jerusalem, which he reconquered in 1187 (before it was again lost to Islam, briefly, in 1229). Asbridge suggests, however, that for all his energy in uniting Islam (which he achieved by suppressing the brilliant civilisation that had flowered in Egypt under the Shiite Fatimids), Saladin had “neither the will nor resources to complete the conquest of the Palestinian coastline”. It would be left to the much more ruthless and fanatical Mamluk Sultan Baibars, who held back the Mongol invaders at Ayn Jalut in 1260, to create the conditions leading to the final exit of the Franks from Palestine in 1291. Yet despite all the battles and sieges, commerce continued unabated. The Spanish Muslim traveller Ibn Jubayr, who visited the Levant in the early 1180s, found the Muslims of western Galilee living in farms and orderly settlements alongside the Franks. He even suggested that his co-religionists were more likely to be treated with justice by a Frankish landlord than by one of his own faith. The military order of the Templars, who occupied the Temple Mount in Jerusalem, allowed Muslims to pray individually in the al-Aqsa mosque, while even in the heat of battle a knight might be allowed the dignity of answering a quiet call of nature before returning to the fray. Both of these books contain compelling narratives that resonate inescapably with contemporary events. Each of the authors has published previous books – Asbridge on the First Crusade, and Philips on the disastrous Fourth. Both play to their detailed knowledge the sources, without appearing to repeat themselves. If a common message can be gleaned through the mayhem of distant battles, it is that fragments of human decency can survive the furies inspired by contested symbolic appropriations of a jealous Abrahamic god. This entry was posted in Modern Books and tagged Alexius Comnenus, Byzantine, Byzantium, Constantinople, Crusades, Fourth Crusade, Muslim, religion, Saladin, Turks. Bookmark the permalink. I am a middle school teacher in NC and came across your site while researching the Crusades for my history class this year. I just wanted to thank you for the great information and articles. We would love it if you could write a couple articles for us, link to us to help us spread trusted resources to other teachers, or even if Tweet or “Like Us” on Facebook. Anything is much appreciated in our quest to spread trusted resources. Certainly I will highlight your site in a future post which will get tweeted! Careful. Thomas Asbridge doesn’t tell you the whole story. He portrays the West — politically correct — as bloodthirsty, but leaves out the fact that countless Byzantines were massacred by Arabs in Anatolia. In 837 Theophilus sacks the border stronghold Sozopetra. This enrages al-Mu’tasim who swears vengeance and heads for Amorion, the birthplace of the emperor. “….on 15 augustus  the Arab army poured into the city. Part of the garrison made a final stand in a monastery but it was set alight and they, and the monks inside were burned alive. In all, 30.000 people were slaughtered and ove 1000 women were raped…..and the entire city was burnt to the ground”. Better forget the stories about mild-mannered muslims and blood-thirsty christians: it has little to do with history. I was glad to see that Gerard Westhoff was keen to emphasize at last, the fact that there had been reported atrocities on both sides of the Muslim/Christian conflicts in Anatolia, rather than the usual anguished breast beating about just what the horrible Franks & their cohorts got up to. All society at this time, whether east or west Muslim or Christian was warlike and nasty and on the whole manipulated its particular reasons for carrying out what was usually to be an invasive but deemed to be a ‘Just War’. So what always surprises me is that when any discussions/programmes take place on the reasons for the 1st crusade, little mention is ever made of the impact that various earlier invasions of christian North Africa, Iberia and even as far as Poitiers, had on christian society. Just because no one made a written record of any atrocities committed during these waves of invasion does not mean they did not happen. I have no religious axe to grind, and do not condone violence, but feel that the 1st crusade should not be examined out of context of what had occurred in North Africa. Nor do I think it right to dismiss this with ‘Jerusalem had been in Muslim hands for over 400 yrs’ and they had not bothered to do anything before that. This fact gave even more reason for fanatical Popes such as Urban to believe mistakenly that they would be able to at least reclaim Jerusalem.